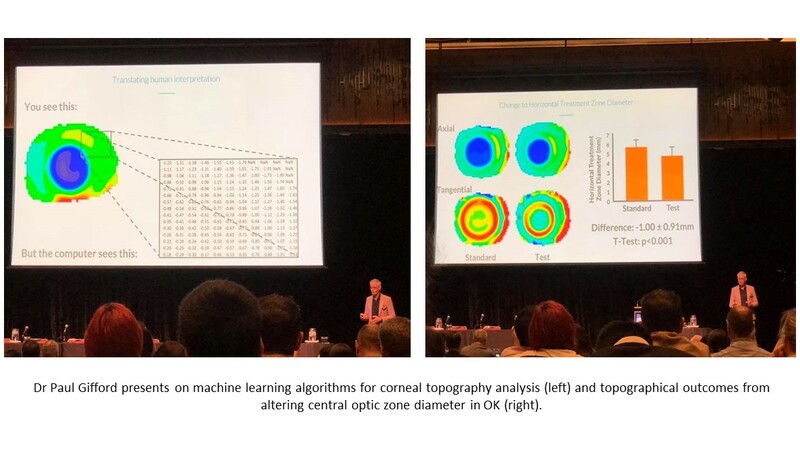 The biennial Orthokeratology Society of Oceania (OSO) conference was held in October 2018 at the Gold Coast, Australia. Along with Part 1, here are a handful of summaries I posted to the Myopia Profile Facebook page during the conference under #OSO2018. Dr Paul Gifford, co-founder of Myopia Profile and Adjunct Senior Lecturer at the University of New South Wales (Australia), explained what he’s been up to in his ‘digital man cave’, developing machine learning algorithms for automated topography assessment. (Image top left) Paul explained that a google team have recently used 128,000 images to automate diabetic retinopathy analysis with accuracy as good as retinal specialists. On a much smaller scale, he’s used over 300 maps from our clinical practice to develop a ‘brain in the machine’ which analyses the numerical data outputs from a post OK topography map, to predict the shape change through a neural network process (machine learning). His little machine monster has been compared against classification by experts - myself and my colleagues Natalie Buckman and Felicity Sklavos had loads of fun raking through classification of hundreds and hundreds of maps in the testing phase - with an 82% accuracy rate revealed. What does this mean for us in practice? Paul’s automated topography analysis algorithm is still in early phases and will need more data to become even more accurate. For novice fitters, this has the exciting potential to leverage the analysis expertise of numerous experts rather than just relying on the analysis experience of that one person. For an experienced fitter, it’s about saving time and improving efficiency. Paul’s final message was not to worry about the machines taking over - while the world champion chess player Gary Kasparov was beaten by a machine about 20 years ago, more recently some intermediate level human players, in combination with a machine, have proven themselves unbeatable by either man or machine in isolation. So, if we can learn to work with our future machine overlords 😉 , we’ll do better than either will alone. This is a hot topic - changing optic zone size in OrthoK to decrease the treatment zone, and the assumption that this will create a better myopia control effect. Dr Paul Gifford presented research ‘so new that the paint is still drying’ (he was crunching the data the night before!) from work he’s being doing at the University of New South Wales (Australia) with Pauline Kang and Vinod Masseedupally of the ROK group and two rather brilliant final year Optometry students, Michael Tran and Courtney Priestley, who’ve done the data collection for their final year research project. In a repeated measures design, the group fit 17 young adults with standard OK design for a week, then they had a week washout, then another week in a modified design with a smaller optic zone diameter (OZD) and increased asphericity. They found that there was a significantly different topographical effect, with the OZD an average of 1mm less. (Image top right) The recent work of Langis Michaud's group has also shown a change in topography with a 4-curve versus 5-curve design. What hasn’t been shown yet, though, is if this transfers through to a change in relative peripheral refraction or not. Promisingly, the UNSW group did find a greater relative peripheral myopic shift with the smaller OZD design, although with current early analysis, both lens types were significantly different from baseline but didn’t quite reaching significant difference between the two designs, despite the appearance of the trend. The final question, then, is if the change in topography which translates into a change in peripheral refraction actually further translates into an improved myopia control effect. Nobody knows that yet. So it’s too soon to say that this OK design will give a better myopic control effect than that design, from the research evidence. But this is a promising start! Difference in daily outdoor light exposure could contribute to geographic differences in myopia prevalence. Associate Professor Scott Read from Queensland University of Technology (Australia) presented data on Australian childrens’ average outdoor time per day (105 min/day) to Singaporean children of the same age (61 min/day). Interestingly, this big difference seemed to occur during school hours, with similar amounts of outdoor time gained in after school hours. The take home message? Less than 60 min / day appears to increase risk of childhood myopia development, and increasing daily bright outdoor light exposure by 60-90 min a day seems to be protective. Read OSO2018 Part 1 here.